Team Unicorn star Dimitri van den Bergh has scooped the prestigious Young Player of the Year award. A unanimous choice, Dimitri is currently in Australia on an exhibition tour. It is recognition for a superb player with a massive future in the sport. 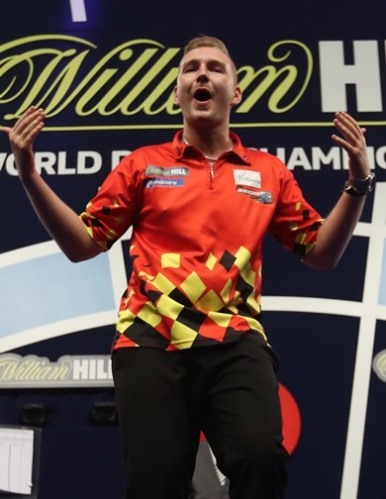 The 23-year-old Belgian is destined for great things and he received the honour at the glittering PDC Awards Night at the Dorchester Hotel in London on Monday night. Of course, Van den Bergh was crowned PDC Unicorn World Youth Champion after a convincing win over Josh Payne in the final. He reached the quarter-finals of the World Series in Glasgow and then came within an ace of reaching the World Championship semi-finals, edged out 5-4 by Rob Cross in a thrilling quarter-final at the Alexandra Palace. And PDC Chairman Barry Hearn has already confirmed that the Unicorn star will be involved in this year’s World Series Tour. The other nominees for the Young Player of the Year were Unicorn’s Ted Evetts, Irishman Steve Lennon and Germany’s Martin Schindler. Elsewhere at the awards ceremony, Michael van Gerwen was named Player of the Year and new World Champion Rob Cross won four gongs, including the prestigious Players Player of the Year. Sky Sports presenter Dave Clark was inducted into the PDC Hall of Fame.